GMC is trying to grow its popularity younger and more active buyers, with the additional of the 2019 GMC Sierra Elevation. The new trim package adds a bolder stance and more off-roading ability, perfect for the people who love camping, kayaking and pickups! The Detroit Three are all shifting their production toward the growing popularity of pickups. Trucks rule right now, especially with the younger, more active demographic. GMC just announced the 2019 GMC Sierra Elevation, a new version of its well-known workhorse that is perfect for the active set. GMC is promising a bolder design, better capability and more connectivity, all designed with younger buyers in mind. According to GMC, “The Sierra Elevation, along with Denali, AT4 and SLT, is designed to meet the needs and preferences of discerning GMC customers.” The next generation Sierras are designed to have a more aggressive stance with chiseled fenders and a taller hood. The new look is accentuated with a bolder grille. The 2019 GMC Sierra Elevation has distinctive monochromatic door handles, bumpers and grille trim. The commanding design is highlighted by black exterior accents, including the grille insert and tow hooks. The 2019 Sierra Elevation also includes the latest in lighting upgrades. New high-intensity LED headlamps will incorporate C-shaped "light blade" signature lighting, LED fog lamps and C-shaped LED elements within the taillights are all standard. Ford, Ram and Chevrolet already have a number of models aimed at the younger, more active pickup drivers that may be involved in camping, kayaking or biking. It makes sense that GMC would add more athletic versions to attract younger drivers to its brand. The Sierra Elevation is based off the double cab model and is offered with two- or four-wheel-drive configurations. The redesigned 2019 GMC Sierra double cab has nearly 3 inches of additional rear-seat legroom compared to the current model. The 2019 GMC Sierra Elevation also includes new technology to make handling the truck easier on different terrain. A new Traction Select System allows the driver to choose from preset modes designed for distinct purposes or conditions. The driver can just twist a dial and select preset modes that can adjust Sierra’s transmission shift points, throttle mapping and other systems to optimize performance for the situation at hand. For example, Terrain mode configures the Sierra for more rugged conditions. 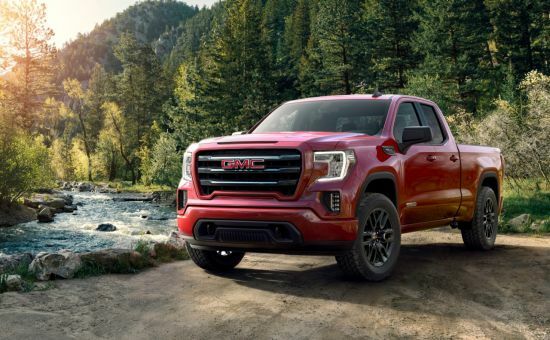 The 2019 GMC Sierra Elevation will offer a special package for the people who love off-roading. The X31 Off Road package, includes unique suspension tuning with Rancho shocks, a locking rear differential, Hill Descent Control, protective underbody skidplates, dual exhaust system and a two-speed transfer case with low-range gearing topped off with all-terrain tires. A special ProGrade Trailering system is available to make connecting and towing a trailer easier. The 2019 GMC Sierra Elevation will have an all-new 2.7-liter turbocharged engine paired with an eight-speed automatic transmission that delivers 310 horsepower and 348 lb-ft of torque. A 5.3-liter V-8 is also available. Early in 2019, the Sierra Elevation will also be offered with a new 3.0-liter turbo-diesel inline-six-cylinder engine. GMC is not releasing estimates for fuel economy. GMC is also promising better connectivity and an upgraded Infotainment System that incorporates Android Auto and Apple CarPlay compatibility. The 2019 GMC Sierra Elevation will be available later this year. No word yet on pricing.